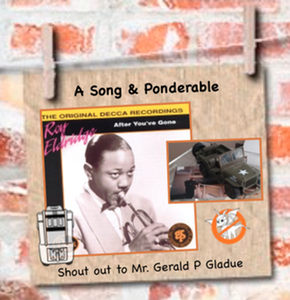 He mentioned in his memoirs that he attended a Roy Eldridge concert while on leave. So here is a version for your listening pleasure. The Jukebox also found Benny Goodman’s take (he’s one of our Gang here at Jedemi). Jukebox Sez: Found My Thrill… Jukebox Sez: Picking Up the Pieces… Jukebox Sez: Hip to be Unsquared Jukebox Sez: Good Day – Hurrah!